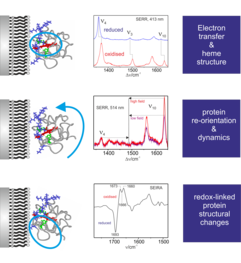 Biological electron transfer reactions may occur on quite different time and length scales. Our studies focus on the long-range electron transfer processes between protein cofactors in the electronic ground states. Special emphasis is laid on cytochrome c but also other heme proteins are studied. The investigations aim at understanding the mechanism and dynamics of these electron transfer processes on a molecular basis. One of the key questions we are interested in is the role of local and interfacial electric fields on the electron transfer mechanism and dynamics. This issue is of fundamental importance since many electron transfer reactions occur at membranes and thus may be subject to high local electric field that may exceed 109 V/m. Such high electric fields can perturb protein and cofactor structures as well as the dynamics of charge transfer processes (see also Protein-membrane interactions). These effects can be probed by (time-resolved) SERR and SEIRA spectroscopy. To quantify local electric field strengths, appropriate electric field sensors may be inserted site-specifically in the protein or at the model membrane. These sensors include highly localized modes with stretching frequencies that sensitively respond to the local electric field (vibrational Stark effect). Thus, probing these modes by IR spectroscopy opens the possibility to map local electric fields on protein surfaces and membrane/protein interfaces. Völler, J., Biava, H., Koksch, B., Hildebrandt, P., Budisa, N. (2015) Orthogonal Translation Meets Electron Transfer: In Vivo Labeling of Cytochrome C for Probing Local Electric Fields, Chem.Bio. Chem. 16, 742-745. Alvarez-Paggi, D., Meister, W., Kuhlmann, U.; Weidinger, I., Tenger, K., Zimányi, L., Rákhely, G, Hildebrandt, P., Murgida, D. H. (2013) Disentangling Electron Tunneling and Protein Dynamics of Cytochrome c trough a Rationally Designed Surface Mutation, J. Phys. Chem. B., 117, 6061-6068. Schkolnik, G., Utesch, T., Salewski, J., Tenger, K., Millo, D., Kranich, A., Zebger, I., Schulz, C., Zimányi, L., Rákhely, G., Mroginski, M. A., Hildebrandt, P. (2012) Mapping local electric fields in proteins at biomimetic interfaces, Chem. Comm. 48, 70-72. 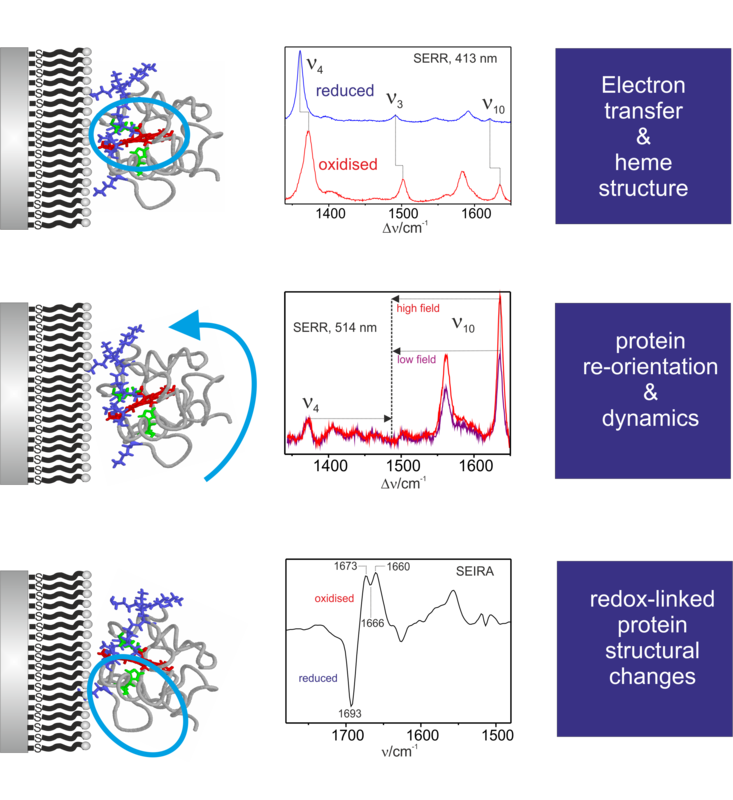 Sezer, M., Millo, D., Weidinger, I., Zebger, I., Hildebrandt, P. (2012) Analysing the catalytic processes of immobilised redox enzymes by vibrational spectroscopies, IUBMB Life 64, 455-464. Ly, K. H., Wisitruangsakul, N., Sezer, M., Feng, J. J., Kranich, A., Weidinger, I., Zebger, I., Murgida, D. H., Hildebrandt, P. (2011) Electric field effects on the interfacial electron transfer and protein dynamics of cytochrome c, J. Electroanal. Chem. 660, 367-376. Collaborations: N. Budisa, TU Berlin; I. M. Weidinger, TU Dresden; M. DeLa Rosa, Univ. Sevilla; S. Todorovics, ITQB/Lisboa; D. H. Murgida, UBA Buenos Aires.